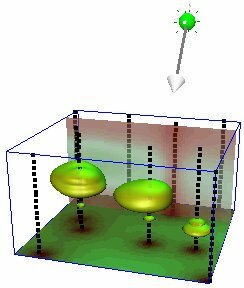 A Voxler isosurface extends the concept of the contour line (a line of constant data value in two dimensions) to display a surface of constant data value in three dimensions. 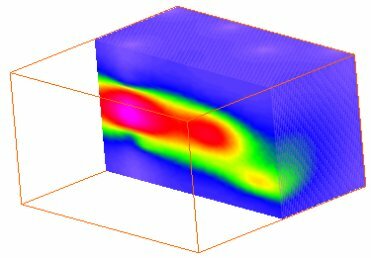 Combine multiple Isosurfaces color-coded by data value to show discrete values through a 3D grid. 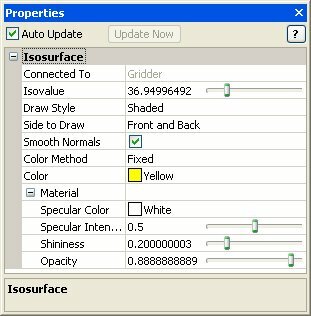 Isosurfaces display surfaces of constant data value. Specify the color and transparency for each surface to indicate its value. A rendered volume assigns a color and transparency value to every element in the 3D grid. Add a ClipPlane to display a slice through the volume at any angle. A rendered volume displays a color for every element in the 3D grid. Add a ClipPlane to display a slice at any angle. 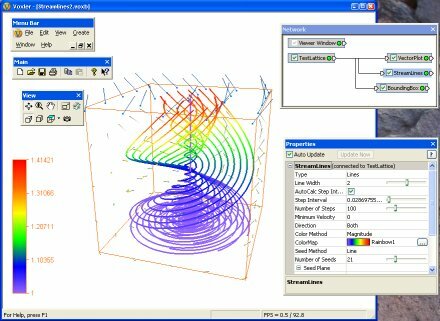 Contours display lines of constant data value along a plane. For a 3D grid, the plane can be oriented at any angle. 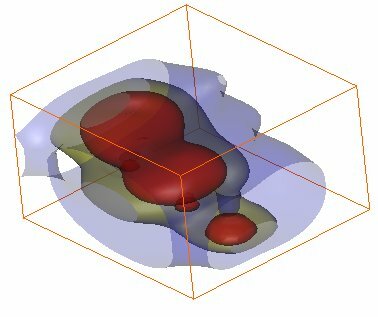 Add contours along a plane at any angle through a 3D grid. 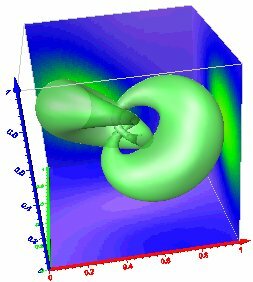 This example illustrates the contours intersecting a semi- transparent isosurface. A height field displays data values as colors for a 2D grid, a 2D orthogonal slice of a uniform 3D grid, or along a 2D curvilinear lattice. The data magnitude is also depicted by the amount of displacement above or below the slice. The displacement is perpendicular to the plane or curvilinear lattice and is adjusted by the scale factor. 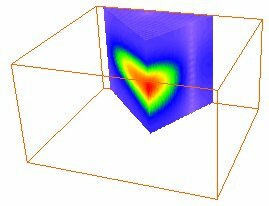 The height field displays data values from an orthogonal slice through a 3D grid. The height field opacity is set to be partially transparent to view the underlying contours the slice. 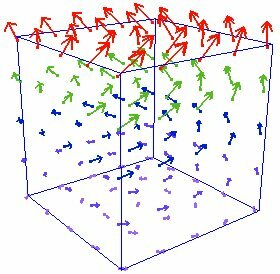 Stream lines are used to display the path of particles through a velocity field, the distribution of velocities of a medium in 3D space. Different colors indicate the magnitude of the velocities. 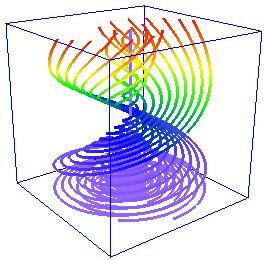 Stream lines indicate particle paths through a vortex. Colors show the relative velocities of the particles, with purple being slower and red being faster. Vector arrows indicate direction and magnitude of the three components parallel to the X, Y, and Z axes in a 3D grid. Magnitude is also shown by color with red being higher magnitude and purple showing lower magnitude. A scatter plot displays symbols at the XYZ location specified in the data file. If the data file has a value at each data point, specify different colors for different data values. A scatter plot displays symbols for the data sampled in boreholes. Different colors indicate different levels of concentration at each XYZ location. 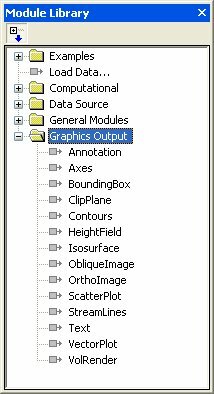 Clip planes remove a portion of a graphic to display the sections hidden by the intervening parts of the object. Here, two clip planes allow the display of an irregularly shaped region. Use annotation and text to add textual information to a plot. Annotation is used to display textual information positioned at the specified screen coordinates. Text is used to display textual information anchored at data XYZ coordinates. This animation shows how text moves when the graphic is rotated. Annotation remains stationary on the screen. Display axes on a plot to show the X, Y, and Z ranges. Change the axis colors and text angles to differentiate each direction. 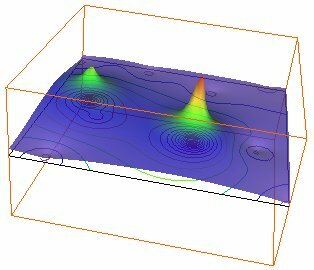 The isosurface on the left is difficult to interpret without any reference points. 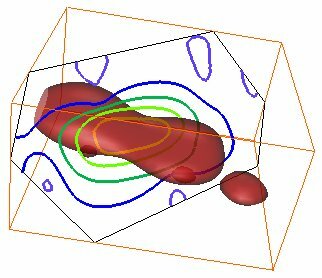 The same isosurface on the right makes a lot more sense with the addition of a bounding box. 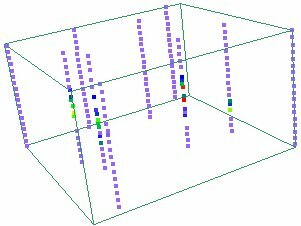 Voxler takes XYZC data (black) and calculates a uniform 3D grid (purple) to use for displaying isosurfaces, rendered volumes, and other graphics. with the addition of a bounding box. Voxler provides a number of computational options including filters for eliminating duplicate data points, removing data points based on the X, Y, Z, or data values, calculating normal, distance-weighted, Gaussian averaging, data metrics, and image processing. 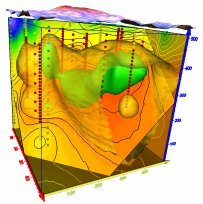 Other computational modules calculate gradient, grid math with up to three 3D grid files, merge up to five 3D grid files, resample, subset, and transform operations. Lighting options include ambient light, camera headlight, directional, point, and spot lights with settings for color, intensity and direction. 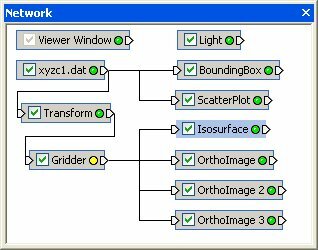 Use the graphical Dragger tool to aim and position directional, point, and spot lights. Use the Dragger tool (shown in the upper portion of the illustration) to graphically position and angle a directional green light on the scene. Voxler features an improved print dialog with a print preview that is especially helpful when printing graphics that cover several pages. Don’t guess at how many pages a large plot will need! View the page requirements in the dialog preview. Print everything, or just the current view. 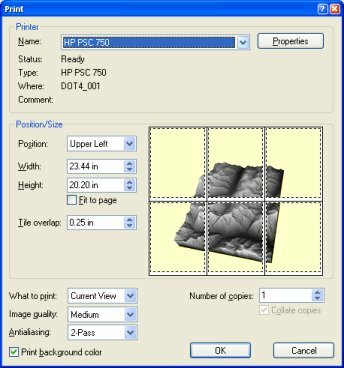 Control image quality, add antialiasing to smooth a print out, and print the background color as needed. Control your printed output with precision and ease. Preview the look of a large plot that spans several pages before you send the print job to the printer. Voxler implements a modern user interface with dockable and floating windows and toolbars. 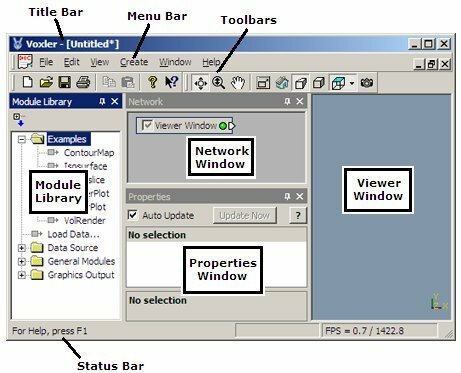 The Network window graphically displays the connections between data and output, and Properties window lists the settings specified for each module. The Voxler user interface consists of windows and toolbars that are docked to the edge of the Voxler application window, or detached and floating. The Voxler Network window graphically displays the modules (input data, computational, graphic output, info) and their connections. “LED” lights display green, yellow, or red to indicate the status of the module. Click on a module to select it and to display its settings in the Properties window. The Network window presents a graphical display of the input data, computational, graphic output, and info modules and the connections between the modules. The Properties window lists the settings for the selected module with edit boxes, sliders, and buttons for changing the settings. The Properties window displays a list of the settings for the selected module. Edit boxes, sliders, and buttons provide the methods for changing the settings. The Module Library shows a list of available modules and commands in an accessible format. The window is docked by default, and drag the title bar to float the window. The Module Library lists the available modules. Double-click on a module to load it to the Network window. Toolbars and windows are docked to the Voxler application window by default, or drag the title bar to a new location to float the windows in any position. Detach the menu bar, toolbars, and windows to rearrange your workspace the way you want it. 256 MB minimum RAM. More memory is suggested for large data sets. Video card with 1024x768x16-bit color minimum resolution.